Schaub was a prolific inventor. 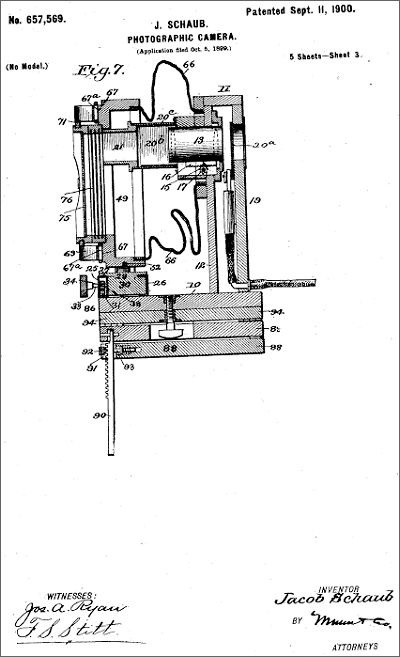 From 1898 to 1944, he applied for and was granted 33 U.S. patents; of which only three were related to photography. Above left and right. 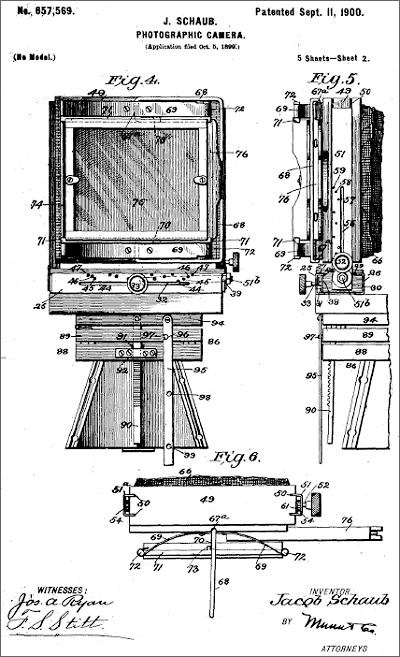 Patent pages 1 and 2 illustrate Schaub's unique multiplying camera design. The patent also describes a tripod head to change the camera orientation because the back is non-reversing. 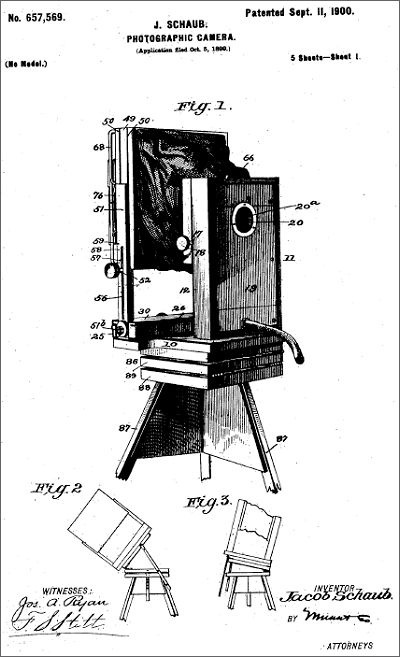 The patent describes a camera capable of making 24 exposures on a plate; while the multiplying camera presented on this website appears to be an improved version with a reversing back (the tripod head is no longer needed) and reversing ground glass assembly. Hardware registration, wood construction, and wood finish also changed. The 'improved' version has a darker reddish finish in comparison to two other known examples that make 24 images and have a light colored wood finish. Left. A cross section of the camera body is shown on the third page. Schuab used a lens tube with slots cut into the barrel for focusing. On inspection of my camera, it appears that a 1/9-tube (petzal formula) was used. This probably lowered the cost of production since this type of lens was readily available. As a note, Jacob Schaub also patented two plate holders; Nos. 603,972 (May 10, 1898) and 771,939 (Oct. 11, 1904). The 1898 patent holder has an outward appearance typical of designs at the time. In contrast, the later 1904 holder has additional hardware to hold the plate.